Devon is such a beautiful part of the world and it’s no surprise that year after year tourists flock to the area to enjoy the beautiful natural landscape, the picturesque beaches and explore the scattered and varied towns and villages. That said, if you’ve tried to escape for a golf break in Devon and ended up bringing the family, you’ll have to dedicate some time to keep them out of trouble! So here’s a list of local theme parks and other attractions near Dawlish for when you stay in our beautiful Dawlish Hotel. Woodlands is the ideal family theme park for all weather, with a vast selection of attractions and rides. Facilities indoors and outdoors mean that come rain or shine, they have you covered for things to do! Set in the beautiful Dartmouth countryside the park really is a must if you’re visiting the area. Make sure to pack a change of clothes though, as there is a number of waterslides and you’re bound to get splashed. 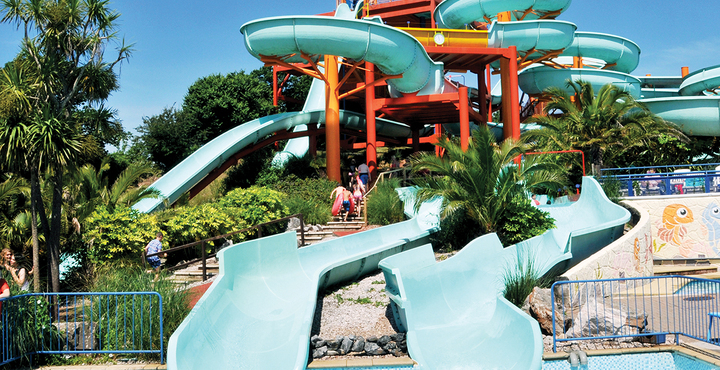 Waterparks are often something associated with holidays abroad to warm and sunny climates, however, Splashdown Quaywest has brought the fun and thrills of the waterpark to the UK. Currently boasting eight slides, a selection of splash pools for younger guests and a swimming pool, the park is perfect for those hot days when you need to cool off in the water! An additional bonus of the park is that it’s located just minutes from the local beach; therefore you can easily make a day of it! Crealy bills itself as the biggest theme park in Devon, and it certainly lives up to the expectation! It continues to add new attractions, rides and installations with a total of more than 60 set across the 100-acre park. There is a range of heart-stopping rides for the thrill-seeking visitors, or a soft-play area for the younger ones to run and play, with a chance to pet the animals held at the park as well! Opening times and ride availability changes throughout the year so we would recommend checking their website for further details. Located right next to the sea in Dawlish, Funder Park is the ideal place for kids to burn off some energy while their parents enjoy some relaxing time, soaking up the sea views. With a wide range of attractions on offer, the park will keep everyone amused for hours and should be on your list of things to do when you visit Dawlish. A bonus of the park’s location is that right next to it are the Grand Prix Go-Karts! Perfect for the whole family, they have a fleet of more than 30 karts that range from karts for the racing novice to the adrenaline junky! They are open from Easter until October and don’t close until 10:00pm in the summer months. Located slightly further away in the equally tranquil and beautiful North Devon, the award-winning Milky Way Adventure Park is billed as the biggest all-weather family day out in North Devon. The Milky Way has a large range of attractions including roller coasters, indoor dodgems, huge bouncing pillows and a whole host more! They also have a constantly changing exhibition that is well worth visiting! The Big Sheep is an amusement park that is located just outside of the town of Bideford in North Devon. The park offers ‘alternative’ attractions such as sheep races and duck trials, along with laser tag and outdoor and indoor play areas. They also host a number of live events and seasonal events such as Halloween features and Christmas markets. Hopefully, this article has given you some inspiration of what you can get up to with the family in the beautiful Devon regions. Whether the sun shines or the rain pours, there will be something here that’s perfect for everyone! Let us know your favourite places to visit in Devon on Facebook and Twitter!